How do you like your Margaritas? Frozen? Salt? No salt? On the rocks? Straight up? Shaken? Stirred? Top shelf? Before the Mojito splashed onto the scene, this legendary Mexican cocktail was my fave. Stirred, salted, straight up and slightly top shelf. (I will spring for the good Tequila but not I am not willing to pay R500 for a bottle of Cointreau. I may spring for Grand Marnier next time. We’ll see and I will let you know how it goes.) This time I went with the house brand of triple sec. This is an incredible cocktail. But, when ordering out, I caution you to request a Margarita from scratch. You never want a Margarita or any cocktail for that matter from a mix. The Margarita ends a series of posts dedicated to my Mexican food cravings and include Guacamole, Salsa and Mexico City Chicken Soup. So be sure to make all four to get the whole fiesta experience. If you are used to the restaurant bar mix made Margaritas that come in array of colors, you may want to thread very lightly here. I found a recipe online last week for an “authentic” Margarita and made one cocktail for the Mexico City Chicken Soup photo shoot. I tasted it and it burned my mouth. The rest I put in the freezer as it was mid week and that drink was lethal. I don’t think I have had a “real” Margarita in a long time. That recipe was not for me though – way too much fire power. Then I stumbled upon the Cooks Illustrated’s Best Fresh Margarita recipe that someone posted. And, I liked it right off. The idea of steeping the zest in lemon/lime juice was refreshing in itself. Now you are on you way to a Mexican fiesta in Margarita Ville. Zest the lemons and the limes. Take care to only make one pass with the zester in any one spot. You only want the colored part. You don’t want the biter white flesh under the skin. Put the zest in a glass jar. Pour in the lemon and lime juices. Allow to steep for 4 – 24 hours. Mine steeped for 3 days. Pour salt in a shallow dish. Slit a small lime wedge. 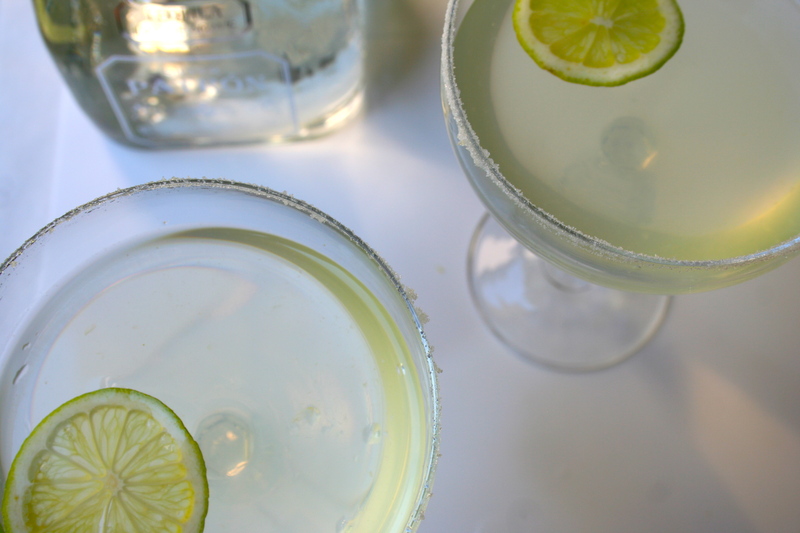 Dampen the rim of a glass with the lime wedge. Swirl glass in salt. Put spirits in freezer for at least overnight. The liquid will be syrupy and will not freeze. But, it will be icy cold. Strain the lemon juice and sugar mixture into a pitcher. Measure and pour the spirits into the pitcher. Stir. Pour. Enjoy. Zest the lemons and the limes. Only make one pass with the zester in any one spot. You only want the colored part. You don’t want the biter white flesh under the skin. Put the zest in a glass jar. Pour in the lemon and lime juices. CI says add ¼ of sugar. I found that way too sweet. Undrinkably too sweet. I would say add no more than 1 tablespoon of sugar and adjust sweetness just prior to serving. Allow to steep for 4 – 24 hours. Mine steeped for 3 days. 1. Combine lime zest and juice, lemon zest and juice, sugar, and salt a jar and refrigerate until flavors meld, 4 to 24 hours. 2. Pour a few tablespoons of salt into a shallow dish and spreading around. Cut a small lime wedge. Make a small slit and swirl around the rim of the glass. Then swirl the glass in the salt lightly. 3. 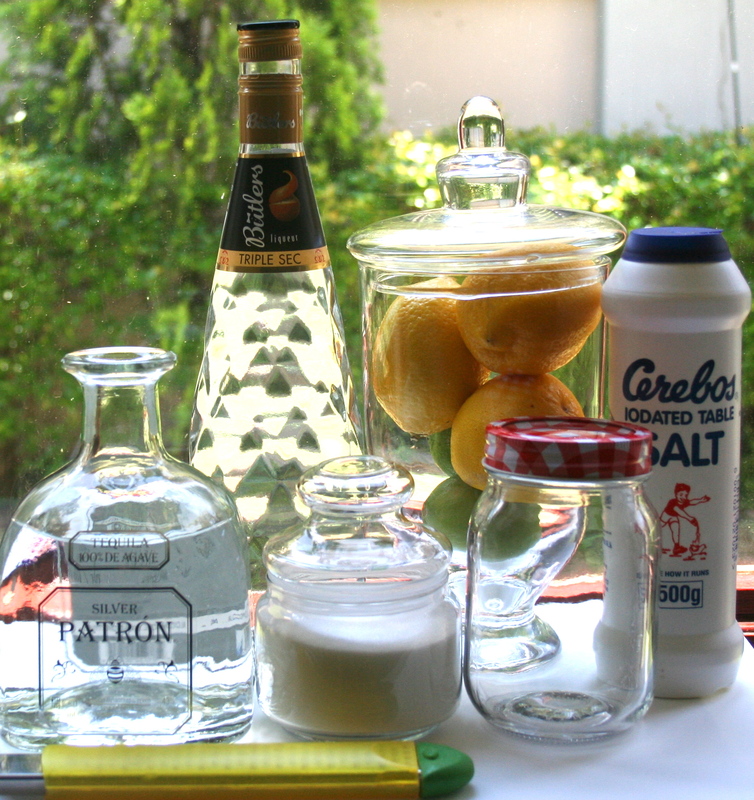 Strain juice mixture into 1-quart pitcher or cocktail shaker. Add tequila, Triple Sec, and remaining crushed ice; stir or shake until thoroughly combined and chilled, 20 to 60 seconds. Strain into ice-filled glasses; serve immediately.